Lakkoi is a nice and peaceful place a little to the east from Frangokastelo in Sfakia, Crete. Its sandy beaches, the crystal clear sea and the serenity form an ideal environment for the holiday makers that seek a peaceful vacation. The ancient city "APOLONEIA" used to be here while today the village "Skaloti" can be found a little further. The drive from Iraklion airport is around 2 hours long and from Hania 1 hour and a half. There are five double rooms with private bathroom - hot water 24hrs/day, air conditioning, refrigerator and large verandas with nice view to the sea. A third bed or babycot can be added upon request. The beach is only 80 meters away. In the lovely tavern's cool shade are served breakfast and meals from the morning till late in the night. The traditional Cretan specialties are all made with extra virgin organic olive oil and other products from the owner's farm. 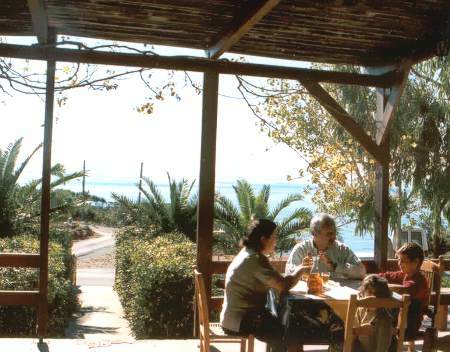 The small resort of Frangokastello, with shops and taverns, is only 4.5 kms away. George Gliniadakis himself, is a farmer and stockbreeder. The farm consists of 1.5 hectares of organic olive trees, vineyards and horticulture. The apartments are located at the boundaries of the farm, so the guests will have the opportunity, if they wish so, to experience rural life at first hand. They will also have the opportunity to acquire the traditional agricultural products of the farm, such as organic olive oil, herbs, myzí̱thra (local white soft cheese) and other local gourmet products. For only one day stay the price is 35 Euros. Breakfast costs EUR 6.00 per person per day. Private parking is possible on site. No reservation required. The full amount must be deposited at least 14 days before arrival. Cancelation or modification is free of charge, if made, up to 14 days before the date of arrival. In case of Cancelation or modification less than 14 days from arrival, or in case of "Non Show", you will be charged the full amount of the reservation. Please send the reservation form and we reply as soon as possible. 1. Prophet Elias (Prophitis Ilias): This is a small Byzantine church built in the 13th century with wall-painted interior. It is located 3 kilometers to the north-west of "Zorbas", on a hill with panoramic view to the Venetian Castle of Frangokastello. It is celebrated each year on 20 July where a festival takes place. 2. Agia Marina & Agia Paraskevi: Those are two small Byzantine churches of the 10th century AD, both with wall-painted interior. The church of Agia Paraskevi is located 500 meters above this of Agia Marina. Here only the frescoes on the northern interior side are preserved. 3. Manika plateau: This plateau is situated 9 kilometers north of "Zorbas Rooms" and above the village of Skaloti. Since 1975 there used to be a summer settlement of the residents of Skaloti. There are still preserved some old, stone built, houses and a few vineyards and fruit trees. There is also the church of Agios Manolis the Sfakian (Agios Manolis o Sfakianos) which is celebrated with a great fair every year on 21st of August. The first is by car, preferably a 4x4 offroad car. The second option is to walk through the Skaloti gorge with the nesting vultures and the plethora of wild herbs. This walk takes about 2 hours.